Keep your projects clean and protected. The Project Cover conveniently and securely covers the front of your project keeping it fresh and protected when you are finished for the day. 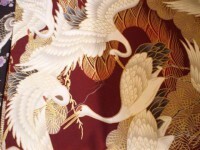 Material: All fabrics are of high quality cotton with a colorful Oriental design and are fully lined. Care Instructions: Cold water wash is recommended. Please note that since Oriental fabric designs are multi-colored, actual Project Cover patterns may vary. Please specify prominent color desired when ordering. See below for examples.